Aomori prefecture is as far north as you can go on the main island of Honshu, and is separated by the Tsugaru Straits from my own homeland of Hokkaido, which is the furthest north you can go in Japan. 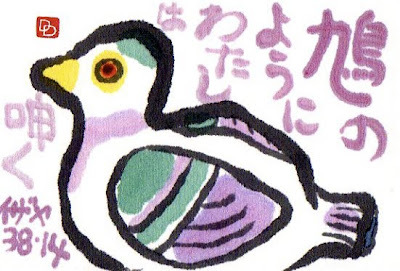 One of the popular souvenirs that people bring home from their travels to Aomori is the Hato-bue (pigeon whistle). Actually, the word for pigeon and the word for dove are the same in Japanese, so you could also call them "dove whistles." These roughly pigeon/dove-shaped, baked-clay tweeters go back to the Edo period (1600-1868), when, it is said, they were given to children as noisy toys in the belief that the racket would protect them from evil spirits. 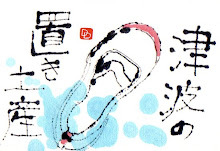 A hato-bue has a hollow center with a sounding slit on its belly and a tail that serves as a mouthpiece. The traditional ones are painted in pastel tones of purple, green, and pink. In a fit of experimentation, I painted the words with a painting brush and gansai paint, rather than the usual writing brush and sumi ink. 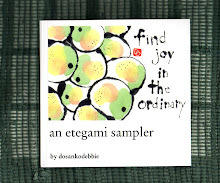 It gives a fuzzy, vague feeling to the whole etegami. The writing translates to: I moan like a dove, and is part of a heart-wrenching cry for help in oppressed circumstances. (See the rest of the passage in Isaiah 38:14-16). A bold experiment well rewarded, this series on the regions hit by the disasters has been wonderful. I've been to Aomori, it was last year, cherry blossom time in Hirosaki, so beautiful. Moaning like a dove, oh yes, I do that all the time :-)) nice one! 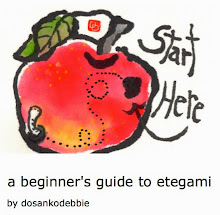 Etegami (e= "picture"; tegami= "letter/message") are simple drawings accompanied by a few apt words. They are usually done on postcards so that they can be easily mailed off to one's friends. 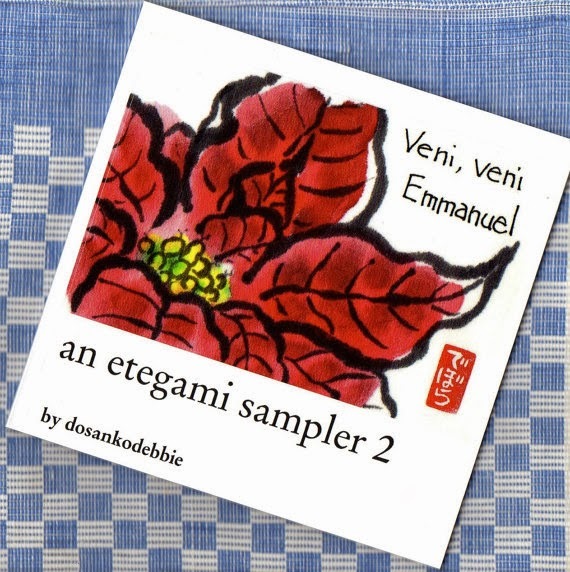 Though etegami has few hard-and-fast rules, traditional tools and materials include writing brushes, sumi ink, blocks of water-soluble, mineral-based pigments called gansai, and washi postcards that have varying degrees of "bleed." They often depict some ordinary item from everyday life, especially items that bring a particular season to mind.